So what do you do when your daughter’s teacher calls and says they are having a PowerPoint crisis… pack up a laptop and head to school. Fortunately this proved to be a fun project, fairly easy to solve and a unique use of PowerPoint. Unique enough to share here. Remember as a kid reading the ‘choose your own ending’ books; each chapter ended with a “To go through left door turn to page 64” and “To go through the door on the right turn to page 71.” That is exactly what the elementary school class project was. In this case each slide was a portion of the story and the viewer has the option of going to one of two storylines. Fun and creative – but needed for an open house this Wednesday! While in the classroom I designed and programmed the template file, which you can download here (feel free to view, use and distribute). Because everyone from the Teacher, volunteers and students need to know what to do with the presentation template I headed back to my office and created this quick tutorial movie using Camtasia (which I supplied to my daughters instructor on CD). View the online version here. I hope to have the completed student story posted on Wednesday or Thursday. And last, I have been asked by many to activate the ‘comments/feedback‘ features on the blog. Well here is one I am opening up to comment, so please feel free to share about PowerPoint in education or anything about this file and tutorial. Everyone has a workplace, mine just happens to move to a different hotel/convention center/conference room nearly every week. Part of the “Fun” is moving in all my computers, patching in everything and teching everything to assure it is doing what it needs to do. I took a series of photos of a recent event, stitched them together in PhotoShop and then experimented with SnagIt’s very easy to use hotspot feature. To see the big image click here. To create a polished look I create virtually all of these placeholder elements in PhotoShop (with bevels, glows, highlights, drop shadows, etc.) and import into the presentation. But aesthetic placeholders can be created in PowerPoint with a bit of creativity with custom fills, bold lines and layered shapes. Download a quick 1 slide sample here. 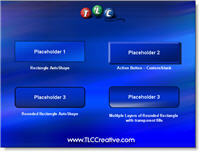 I just finished adding a new project overview to the TLC Creative website. It includes a movie of a walk-in looping presentation I developed for an event, which highlighted the event sponsors. Online is a write-up and movie that shows how it was transformed from good to WOW! Basically, after developing a custom PowerPoint presentation, I used OfficeFX‘s ability to render realtime 3D moving backgrounds and transitions to add that extra something special! To see the write-up and movie click here. Click here to see the project write-up, online movie of the presentation AND download of the full editable presentation.